The 45th president of the United States, Donald Trump, the 70-year-old politician who never held a political post but was catapulted to the highest office in the world riding piggy-back on several controversies, like making disparaging remarks about women, swearing to overturn immigration rules, and "Obama-care", may be grappling with teething problems, but Ganesha foresees a full term for him, and predicts that he will redefine world politics. The real-estate baron who is the owner of The Trump Organization, has built, renovated, and managed several office skyscrapers, hotels, casinos, and golf courses. He organized the Miss USA and Miss Universe competitions from 1996 to 2015, and many product brands are named after him. The Republican Party candidate won the presidential election on November 8, 2016, against Democratic rival Hillary Clinton, and assumed office on January 20, 2017. He is the oldest and richest person to become the US president. Although President Trump entered the White House after a string of controversial remarks and opposition from various quarters of the society, the Oath Chart indicates that he will implement his agenda strongly and decisively. The Oath Chart has Aries Ascendant and Moon is placed in the 7th house in Swati Nakshatra ruled by Rahu. So, he will remain aggressive and determined to follow his own doctrine. His actions may be considered unconventional and may also disrupt the establishment. His energy and actions will however drive the USA in a new direction. Strong Sun in the 10th house indicates that he will have total control over the administration and he will make some effective changes in the current administrative practices. However, Saturn is aspecting the Sun, which indicates that Trump will face big clashes with Congress and resistance from his own party. 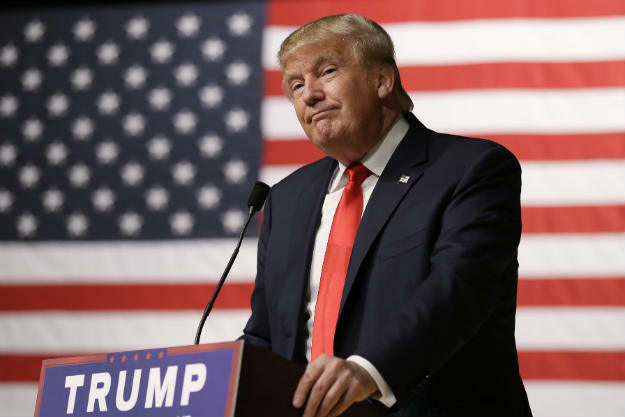 Trump may reign supreme despite the challenges. But what about you? Will you be able to enjoy good success in your career? Get to know with the 100% personalised report - Career Ask A Question. Mercury and Jupiter are in exchange. So, his focus will remain on US economy. His efforts will bring some good results and will boost the US economy. Infrastructure will improve. However, he will face resistance and differences over spending or allocation of money for big infrastructure projects. The Lord of 2nd house Venus is placed with Ketu in the 11th house. So, he would break from the traditional Republican commitments and is likely to form a new block, union or treaty replacing the old. Though his actions and policies will be in the interest of US, in the short-term, some pain will be felt and may also bring some uncertainty and confusion. The placement of Mars in the 12th house and its aspect on Moon indicates that he will redefine the foreign policy. He will keep American interests on top and may formulate his policies accordingly. His biggest challenge will be to keep old alliances intact while forming news ones. First sign of tensions among the current alliance will be visible after August 2017. There will be growing tensions with neighboring countries. His policies will affect and shake the entire world in the period between March 2019 and February 2020. He will have to be extra careful for internal security of the US as well as his own during the said period. His tenure as President will redefine world politics. Although, he will have strong support from his followers, various sections of US society may remain unhappy. There will be social unrest in US. The period starting from March 2018 may bring major challenges and public sentiment will not be in his favor particularly after January 2020. However, he will be able to complete his full term as the longevity of his presidency seems strong.